circulatory system. 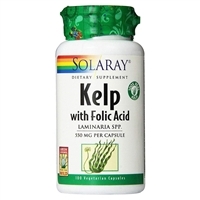 Kelp is the richest plant source of calcium and contains many other minerals and vitamins, including Vitamins A, B1, B2, C, D and E, zinc, iodine, magnesium, iron, potassium, and copper. He Shou Wu and often used on an alternating basis with Ginseng. This whole root has not been processed to remove glycyrrhizic acid. When glycyrrhizin is removed from Licorice, the product is called deglycyrrhizinated licorice or DGL. Stinging Nettle seed is a rich source of essential fatty acids. Stinging Nettle seed is currently being used in clinical practice as a trophorestorative for degenerative kidney disease. Cases of chronic nephritis with moderate loss of kidney function, glomerulonephritis and Bergner's disease have shown improvement of renal function and increased excretion of wastes. In old herbals, Stinging Nettle seed was also recommended for goiter, tuberculosis and malaria fevers. Warnings & Disclaimers: Caution: As with any dietary or herbal supplement, you should advise your health care practitioner of the use of this product. If you are nursing, pregnant, or considering pregnancy, you should consult your health care practitioner prior to using this product. This product is not intended to diagnose, treat, cure or prevent any disease; the law applicable to dietary supplements, the Dietary Supplement Health and Education Act of 1994, commonly referred to as DSHEA, does not permit us to do so and it is not our intention to do so. The Contraindications and Potential Drug Interactions information provided on this website is not intended to be all-inclusive. Keep your healthcare provider informed about any herbal and other dietary supplement products that you are taking. *This statement has not been evaluated by the FDA. This product is not intended to diagnose, treat, cure or prevent any disease. Warnings & Disclaimers: Caution: As with any dietary or herbal supplement, you should advise your health care practitioner of the use of this product. If you are nursing, pregnant, or considering pregnancy, you should consult your health care practitioner prior to using this product. This product is not intended to diagnose, treat, cure or prevent any disease; the law applicable to dietary supplements, the Dietary Supplement Health and Education Act of 1994, commonly referred to as DSHEA, does not permit us to do so and it is not our intention to do so. The Contraindications and Potential Drug Interactions information provided on this website is not intended to be all-inclusive. Keep your healthcare provider informed about any herbal and other dietary supplement products that you are taking. Chaga is a nutrient-dense mushroom with a wide range of health and anti-aging benefits. Cat's Claw is from the rain forest of Peru. Cat's Claw shows promise as an immune potentiator, anti-inflammatory and bowel tonic. Traditional uses include testicular and other cancers, arthritis and "leaky gut" syndrome. as a libido restorative for both men and women.